A city in the east of Kazakhstan, whose old name of Semipalatinsk is forever associated with the Soviet-era nuclear test site (Polygon). The devastating legacy of decades of nearby nuclear testing is the subject of a couple of local museums and a dedicated monument. Other than that the city also serves as a good base for further dark explorations in the area. More background info: for the history and other background information on nuclear testing at the Semipalatinsk Test Site (STS) see under Polygon and Kurchatov, especially its Museum of the Test Site. The city of Semipalatinsk has been renamed Semey partly to shake off the negative connotations of the old name, and also in line with a general trend of "Kazakhification" of place names all over the country (cf. Astana, Almaty, etc.). But its historical origins go back to early 18th century Tsarist Russian expansion into the south-east, resulting in the construction of a fortress on the river Irtysh. It developed into a trading post, and for a while also had notable political significance during the early 20th century in particular. During the Soviet era it was at least a regional capital, but in independent Kazakhstan it lost that status in 1997 when the Semipalatinsk region was merged into East Kazakhstan, whose capital is Ust-Kamenogorsk (or Oskemen, as that place's parallel name goes). Economic decline too accompanied the post-independence fate of the city, but things are slowly looking up a bit again. One symbol of contemporary hopes is the shiny new suspension bridge over the Irtysh river, built with support from Japan. The city's tourism efforts try to focus on other claims to fame, such as Semipalatinsk's associations with both the Kazakh "national poet" Abai, as well as with one of Russia's top household names of literature: Fyodor Dostoevsky, who for a few years was exiled to this place in the mid-19th century. What there is to see: the main reason for a dark tourist to make it to this far-away place is, naturally, its association with the legacy of nuclear testing during the Cold War era. While the actual tests themselves were conducted nearly a hundred miles (160 km) further west at the Polygon, it was the city of Semipalatinsk that suffered the most from the fallout. And the evil effects of the radioactive pollution can most drastically be studied at the Semey Medical University's anatomical museum. The subject of nuclear testing in the area is also covered in Semey's local history museum, which is also allegedly one of the oldest museums in Kazakhstan (going back to the late 19th century – well before the issues of the atomic age even dawned on the horizon). Fittingly, it is housed in an old-style Tsarist-era building, although it was only moved to this present location in the late 1970s (at No. 5 Lenin Street in the south-west of the city centre, not far from the Medical University). At the time of my stay in Semey in August 2011, however, the museum was "remont", i.e. undergoing refurbishment (of a significant scale, going by the look of the building site on its grounds) and was thus closed to the public. I cannot therefore report anything about its contents first-hand. According to both Semey's tourist website as well as the Bradt guidebook to Kazakhstan, however, one major focus of the museum – apart from the usual prehistoric, anthropological, natural history and such sections – is that of nuclear testing in the area. There are supposed to be models of underground testing, photos of the "Atomic Lake" (see Polygon), newspaper clippings etc. about the Nevada Semipalatinsk Movement, the president's closing of the site, and also photos of more medical defects due to the atomic legacy. The museum's published opening times are Monday to Saturday between 9 or 9:30 a.m. and 5 p.m. (closed every last Friday of the month), and the admission price was quoted as 100 KZT in 2008; it'll possibly be more when the refurbished museum reopens. 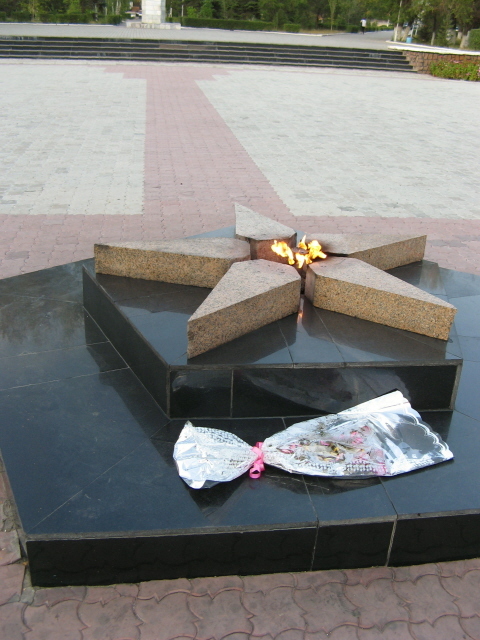 Yet another site dedicated to Semipalatinsk's atomic legacy is the Monument to the Victims of Nuclear Testing, better known locally under the informal name "Stronger than Death Monument". It consists mainly of a tall slab in which the silhouette of a mushroom cloud is cut out. Inside the mushroom cap is a metal object that looks a bit like a cross between a spark of light and an atom symbol. At the base of the cloud, i.e. at "ground zero" as it were, there's supposed to be a sculpture of a woman shielding her child from the nuclear inferno (right at the epicentre of the blast?!? Good luck!) – but when I visited the site it, too, was undergoing substantial refurbishment and the sculpture was boarded up. The black marble plating of the concrete monument had been peeled off, presumably to be replaced with a new layer. The grounds around the monument were being dug up and lots of heavy construction vehicles were vrooming noisily about. I could, however, make out that the black marble slab next to the main monument still features only an unfinished map of Kazakhstan. Allegedly (according to the Bradt guide, again) it was intended to show all the sites of elevated radiation within Kazakhstan. As it (still) is, the only location on it that is marked in writing is that of the former capital Almaty. Otherwise the only features shown are lakes, some not entirely realistic (including a way too large depiction of the Aral Sea). The location of the memorial ensemble is a bit out of the centre to the east, in a green, wooded area on a river island, just off a road that bends off to the right opposite the Abai monument on Abai Street, ca. two-thirds of a mile onwards on the left. Not associated with the nuclear history of Semey, at least not directly, but also of interest to those dark tourists with a taste for the old communist cult of personality in the form of socialist realist statuary: you can find one of the best collections of such statues anywhere in Kazakhstan (IMHO even better than that at Aksu) hidden in a small park just beyond Hotel Semey, to the left off the northern end of Lenin Street. It is dominated by a truly gigantic Lenin, flamboyantly throwing his right arm behind, maybe to indicate the way for socialist progress (but uncannily reminiscent of that famous John Heartfield montage in which an industrialist's hand lowers a wad of cash into Adolf Hitler's palm, as it was raised up behind his head, in Adolf's own iconic style of greeting). Leading up to the giant is a whole alley lined with smaller statues and busts, many of them also Lenins, not all in similarly good shape as the big brother, including one in decidedly mis-proportioned execution (his legs are way too short), and a couple of Lenin heads that look really battered, as if some locals couldn't resist the urge to give them a good kicking. Kirov, Frunze and Marx are also represented, the latter in a posture and with facial expression that can easily be misinterpreted as confused and lost … which he is, like all his colleagues in the ensemble. Apparently they had at one point been put together at a different site in a more prominent location near the river and the city centre, but have more recently been relegated to this more secluded spot. It's a similar story all over the former Eastern Bloc and Soviet Union. At least, here they have not been destroyed altogether. 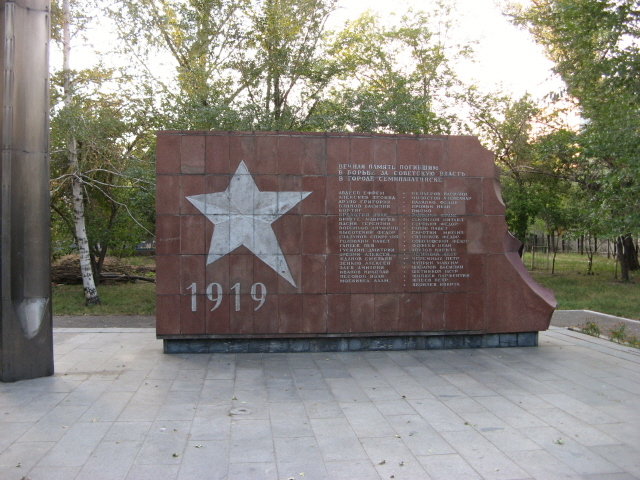 Still in prime locations are the monuments in Victory Park, just south of the Hotel Semey between Kabanbai Batyr Street and Valikhanov Street alongside a pedestrianized stretch of Lenin Street. This includes a T-34 tank on a plinth that appears to be just like the many such tanks put on a pedestal during the Soviet Union's celebration of victory in WWII (or "Great Patriotic War", in Russian lingo). Only in this case it was apparently erected as recently as 1995, after the dissolution of the USSR during the early years of independent Kazakhstan. The pavements between the flower beds around the tank are lined with small memorial stones with the names of local military heroes (presumably) on them. 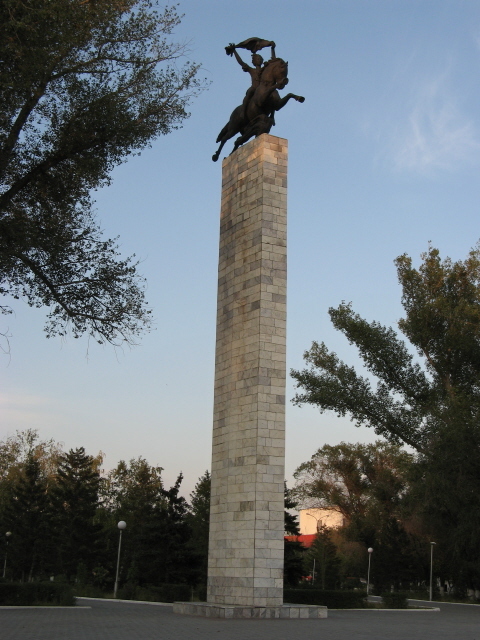 At the northern end of the park stands a tall column crowned with a horse-and-rider in front of an eternal flame. The latter – quite unusually for a place as remote as Semey – is still burning. 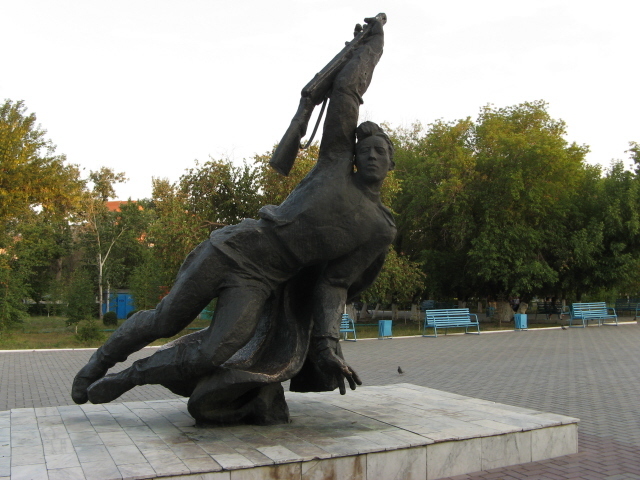 The most remarkable piece in Victory Park, however, is the statue of a falling soldier. He seems to be literally in mid-air at a 45 degree angle as if he's about to hit the ground for his hero's death, still desperately struggling to hold his rifle up to the sky by the barrel (why he would do so remains a mystery). There are yet more war memorials. One, located right opposite the main portal of the Semey Medical University (see anatomical museum) is the most recent one: dedicated to the conflict in Afghanistan which the Soviet Union was dragged into in 1979 and which it couldn't win, despite great costs in human lives. A similar story that is still continuing today, with American and international troops also failing to gain control over that battered, tragic country – cf. Afghanistan Museum. Hidden in a darker corner in the north of the Central Park can be found a slab honouring fallen heroes of 1919. The local fire station is one of the most remarkable buildings in the city: not least for the large Soviet red star at the top of its red-brick main tower, still shining in marvellous defiance of the passing of time. 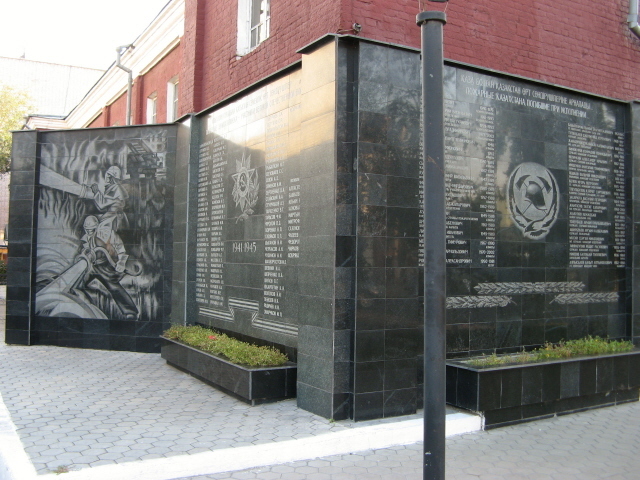 There's also a black-marble memorial stone ensemble at one corner of the building, celebrating both WWII firefighter heroes as well as those who lost their lives on duty in Kazakhstan in the years since. One section sports a comic-book like etching of firefighters amidst a raging blaze of flames. It's fantastically OTT. 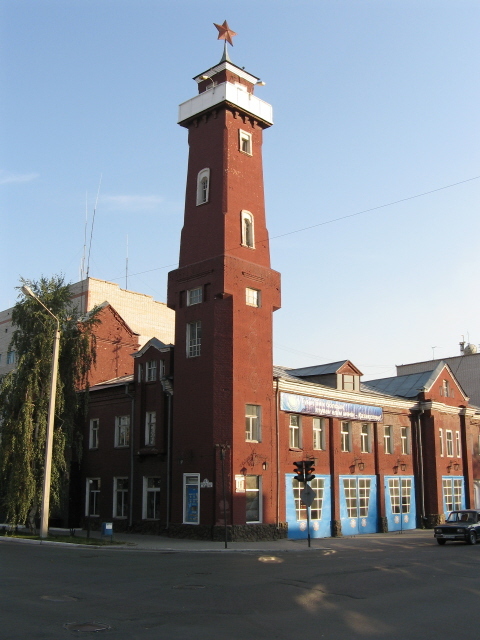 The fire station is located on the corner of Internationalnaya and Dulatov Streets, opposite the north-eastern corner of the Central Park. Finally, there's an intriguing set of ruins and dereliction at the western end of Dostoevsky Street (or Chaizhunosova Street) on the corner of Shakarim Avenue, on the edge of the city centre. One apparently used to be a veterinary institute, the other an unfinished sports centre – but whether these sites will also undergo redevelopment any time soon, I cannot say. Location: in the east of Kazakhstan, on the river Irtysh, ca. 200 miles (320 km) upstream from Pavlodar, 110 miles (180 km) downstream from Ust-Kamenogorsk (Oskemen) and ca. 65 miles (140 km) east of the Polygon test site. Access and costs: fairly remote, but not too difficult to get to. Details: you can fly to Semey airport, which has several connections a week direct to Astana, and also to Almaty, and (at least at the time of writing) even a weekly international one to Moscow. There are trains to Almaty, and Pavlodar can also be reached by train, and there are even onward connections to Russia (but not especially frequently). By road, driving time from Pavlodar is about five to six hours. Getting around in central Semey is mostly feasible on foot, otherwise there are buses (flat rate 25 KTZ) or, more likely for the foreign visitor, taxis. But the only place within the city limits that you may want to take a taxi to (if you don't have any other means of individual transport) is to the Stronger than Death Monument to the east of the centre. The rest is perfectly walkable. There are a few choices for accommodation, including the affordable and well-located (but very "post-Soviet") Hotel Semey, between Victory Park and the alley of communist statues. There aren't many eating-out options, and most places are rather basic. Time required: a day should be sufficient for seeing the main dark sites as well as a wander around the city centre and its parks to soak up a bit of the overall atmosphere. Combinations with other dark destinations: for a full-on nuclear tourism itinerary of eastern Kazakhstan it is of course essential to travel on to Kurchatov, the ex-HQ of Soviet nuclear testing, right on the edge of the Semipalatinsk Test Site, the Polygon, proper. There's a museum of the test site in Kurchatov, which is recommended. But the real highlight in terms of dark tourism would have to be a visit to the site itself, in particular the site of the first as well as many subsequent atmospheric tests conducted here, at a place accordingly named Opytnoe Pole ('Experimental Field'). En route to Kurchatov you can also stop by a former airbase for long-range bombers (also part of the USSR's nuclear deterrent) and its associated garrison town, now a completely deserted, ruined ghost town, called Chagan. 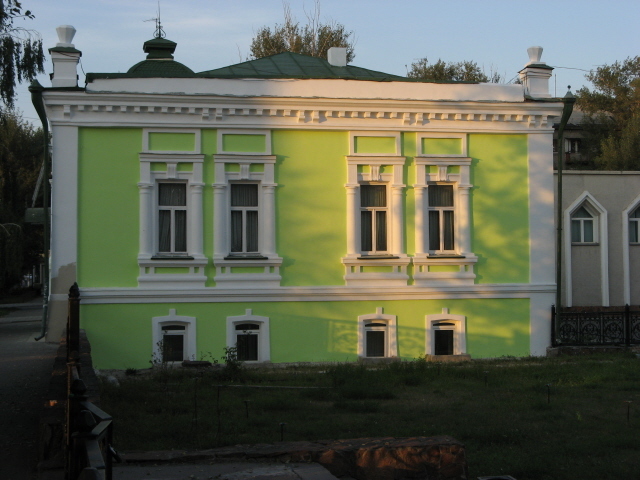 Combinations with non-dark destinations: there are two museums dedicated to one each of Semey's most famous literary associates, an Abai museum and a Dostoevsky Literary Museum, respectively. Furthermore there's a "Fine Arts Museum", a couple of non-dark monuments (Abai's, again, is one of the more prominent ones) as well as mosques and churches that can just about pass as mainstream sights. But overall, make no mistake, Semey struggles to put itself on the general tourist map, even though it has undeniably pretty bits, especially a few renovated Tsarist-era houses and a quite pleasant riverbank location (which it doesn't make anywhere near as much of as e.g. Pavlodar, though).